Kekaha Kai State Park is a great location for a wedding. There is a lot of beach space giving a lot of options for a ceremony location. The drive down is bumpy but doable in any car. Another 5 minutes walk is Makalawena, a very beautiful and popular beach. Getting married on a public beach in Hawaii is not only beautiful but very affordable. The permit is around $50. 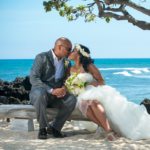 The wedding was on the beach and the reception was held at the Four Seasons Resort Hualalai.